Since this Molecular Genetics group focused mainly on the ‘plant side of life’, the nematodes needed a smart way to“worm themselves” into this lab. Therefore, they used the green fluorescent protein ‘GFP’ to camouflage as a green plant! Even after slowly realizing that they were tricked, the plant group couldn’t resist the charm of this worm and it was adopted in 2016. Since then, Caenorhabditis elegans contributes here to reach the ambitious goal of a healthier society. While lifespan has increased over the past decades in most countries of the world, the number of years where people suffer from diseases and disability was also increasing. Healthspan (the life period when one is generally healthy and free from serious disease) depends on nature (genetic makeup) and nurture (environmental influences, from the earliest stages of development throughout life). Genetic studies increasingly reveal mutations and polymorphisms that may affect healthspan. On the other hand, claims about lifestyle modifications or natural treatments improving healthspan are plentiful. In both cases, rigorous testing is hampered by the long lifespan of model organisms like mice (let alone humans) and the difficulty of introducing genetic changes to examine the phenotype of the altered genome. Therefore, we use the invertebrate model organism C. elegans to identify genetic key players and natural compounds leading to a prolonged healthspan. Due to the relatively high similarity of the C. elegans and human genome, the main results should finally be transferable to humans. Further advantages of this model are its easy cultivation, short lifespan and generation period, and the existence of various transgenic reporter strains and knockout mutants. 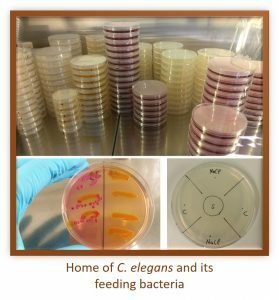 Moreover, the use of C. elegans for research purposes poses no ethical problems, the handling is quite easy to learn and it does not demand extensive financial or spatial requirements. 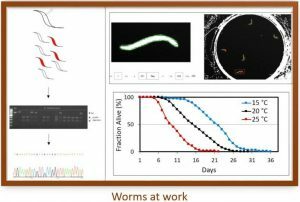 Different health parameters (cognitive function, physical fitness, reproductive capacities, and stress resistance) as well as healthspan markers (that’s where GFP comes back into play) and disease models (like Parkinson’s and Alzheimer’s reporter strains) are used to estimate the health status in our worms after different treatments. Moreover, new reporter and overexpression strains of interesting genes will be constructed and gene expression studies will shed light on the molecular background of our observations. This project is part of the EU-Horizon2020-project “Ageing with Elegans” (http://www.h2020awe.eu).